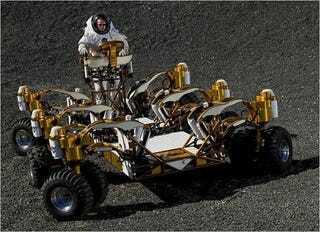 NASA's Lunar Chariot, which costs a reported $2 million to build, has just been tested by the NYT. The top speed of 15 mph may not set tarmac on fire, but it sure as hell can burn a truckload of astro stuff, all with it's six-wheeled wackiness trailing closely behind. The front driving "turret" houses the primary control; a joystick for steering, as well as various cameras and sensors, the feedback of which is relayed to the onboard screen. John Schwartz, the NYT reporter sent out to run the test, didn't get to drive the buggy itself, but he was offered the passenger's seat / stand, and here's what he made of it. • It navigated seemingly challenging terrain with relative ease, even if the ride was not so smooth for the passenger. • The motion of the vehicle was a little disconcerting, as it didn't move in a conventional manner; climbing, sliding and dropping in an apparent erratic manner. • The six wheels could be controlled independently to navigate really, really challenging space spots. • The suspension is souped up to the galactic brim; the chassis can be raised a whopping, 28-inches in height. • It's freaking mahoosive, weighing in at 4,500 pounds it is far too large to make it to the moon in its current state. • The Lunar Chariot is using commercial parts—a cheap webcam and Earth-car grade tires that would never make the final draft, and neither would they survive out in the big old vacuum.